Ever wanted to learn how to harvest clams? Or a lesson in crabbing? 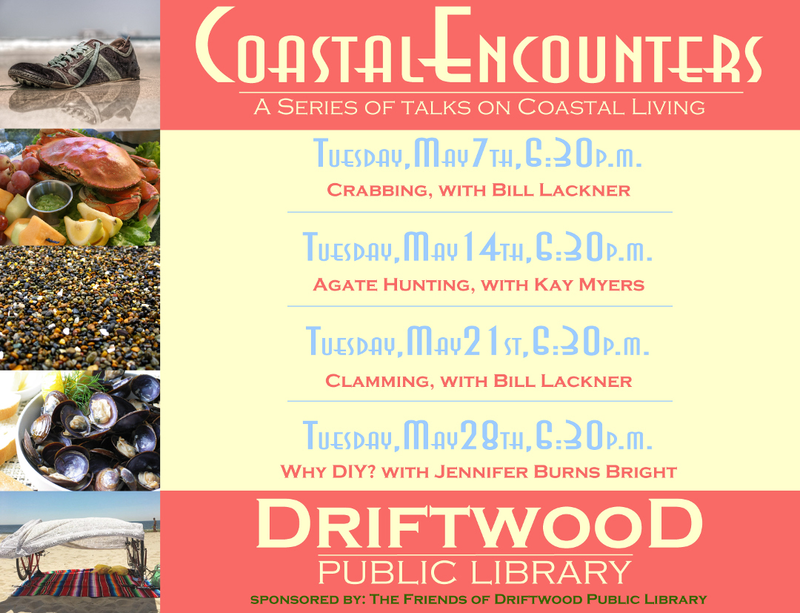 Each May Driftwood Public Library invites you to take part in a series of presentations that focus on Coastal living. Back in early 2005, Bill Lackner, the author of multiple books on crabbing and clamming, approached the library with an idea: he wanted to give a class on crabbing here at the library, and then take participants out to Siletz Bay the following morning to do some actual clamming! Sort of a lecture plus field trip. The staff liked the idea so much, they built a series around it, and each Tuesday evening in May offers a lecture on local Coastal living, often followed by a field trip so participants can experience what they just learned about. Classes have ranged from surfing to cheese-making, farming to agate- and fossil-hunting, and more, always with Bill returning for his popular clamming and crabbing classes. Keep your eyes on our Current Events page to see what we offer next May!